We froze. A four-legged, nearly 500kgs creature, was rumbling towards us with a mighty bellow. When it came close, we involuntarily shut our eyes. Even with our closed eyes and palpitating hearts, we could still feel this scary beast’s presence. When we mustered enough courage to open our eyes, we were astounded to see this brown being roundly pecking on our host, a tall, slim, charming, short-haired lady, who seemed to return the affection in a very warm way. This huge dromedary did not even seem to know or care that we existed. This ‘Ship of the Desert’ was oblivious to all except our host. 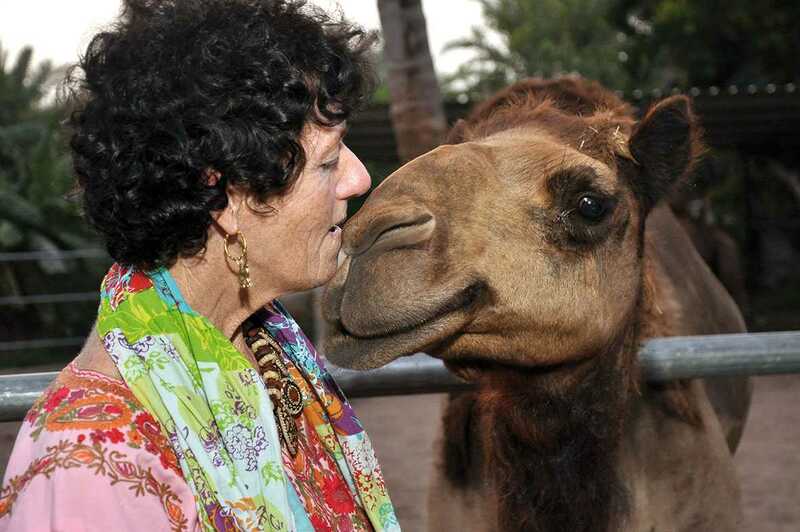 If she had arms like us, she would have hugged Lillianne ‘Layla’ Donders, who in many circles is fondly considered as this region’s own ‘camel whisperer’. Lilliane and Zubeida (18 years), a nearly 13-year old pet camel, who is the oldest of the lot in Lilliane’s little camel pen/farm at her home in Seeb, share an unusual bond. “I bought Zubeida – my first camel – in Syria. We know each other quite well,” Lilliane said as the 13-year old nuzzled into her face. Jealousy or that competitive spirit, especially when it comes to sharing affection, is rabid among all creatures on earth as was witnessed when the others in the pen/farm also rushed to seek Lilliane’s affection. But this ‘camel’ lady had enough and more affection to shower on her other camels Zenobia (28 years) Sheba (13), Zahara (12), Ghazal (4), Shaheen (bull 3), Suleimah (3) and Najmah (2). These camels are part of Lilliane’s home-based stable. While lesser mortals are happy with dogs and cats, Lilliane belongs to a different league altogether. She has these camels (bought over a period of time) all happily residing in her little camel abode. And she also has her share of dogs, Zanzibar (12), Farah (9), Aseelah (2) and Dhabiah (4 months). As the other camels also vied for attention from her, Lilianne went on: “We bought Zubeida, together with her young calf, Sheba, first. It took me some time to learn how to take care of her, look after her needs, provide her with food and the necessary medicines. But, being a nurse by profession, I found it easy to learn the basic medicines and injections needed for a camel. “Today, I can handle most of the infections and sickness that a camel could get. Over the years, I also learnt to train the camels too. Lilianne petted and patted and showered affection on her camels as she spoke to us. She bought her first camel in 1998 in Syria, she tells us. 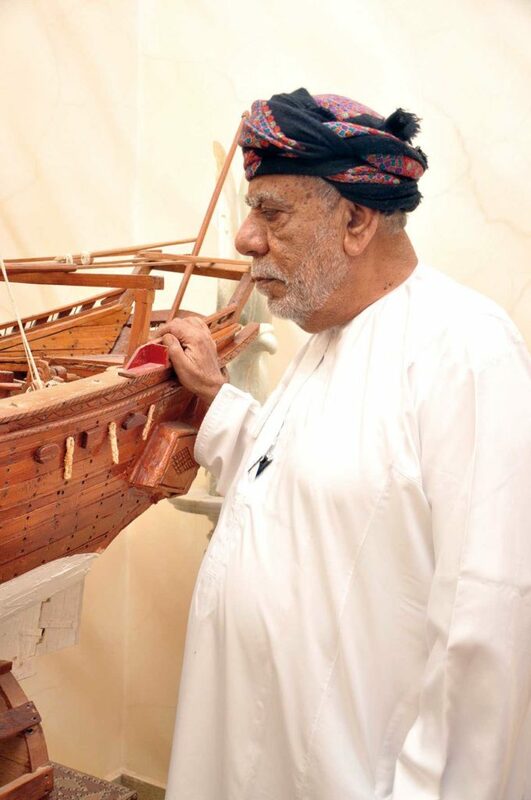 “Actually, my love affair with the camels started long before, and right here in Oman. I still remember that day at a souk in Sinaw. It was the first time I was seeing a camel cry. Actually, that was a very cute little six month old baby camel crying… Tears were rolling out of his eyes, just like it does from our eyes. The poor thing looked so lost, sad and forlorn. The Omani gentleman had sold his mother and was trying to look for another buyer for the baby. The minute I saw this baby, I realised that I was somehow being drawn to the world of camels and that my future was going to be with them in some way or the other. She was right. We were witness to that show of affection, some of them literally pushing the other from Lilianne. After sometime Lilianne took us inside their spacious home and asked us what we would like to drink? “Tea or coffee?” Her husband, the affable, Robert Weener, who is a former Shell bigwig, amiably butted in and asked us whether we would have a spot of camel milk? As we mulled over this issue, both Lilianne and Robert quickly reassured us that camel milk was not in anyway unhealthy. For someone who has been weaned only on cow milk, the camel version is quite a revelation. We tasted it. Slightly saltier, a bit thicker…well, in short, it tasted different, but not at all bad and we are willing to try it again. Many people around the world depend on camel milk though it is said to be an ‘acquired taste’. It contains antibodies which may help to fight against serious diseases like cancer, HIV/Aids, Alzheimer’s and hepatitis B. It is also found to be good for people who are diabetic. Camel’s milk need not be cooked until boiling like a cow or goat’s milk. It is rich in taste and must be taken slowly to allow the stomach to digest. “Camel milk is one of the best and healthiest food item available at home. Why eat food that is filling, but not healthy? And why waste power food when you have it in your own home? Bedouins live with goats and camels and most of the camel milk is wasted. The baby camels do feed on the mother’s milk, but a good healthy camel can produce up to 13 litres of milk every day (CHECK). That is quite a lot of milk at home and that can keep the whole household healthy and shining. It is only a matter of awareness that is lacking. In my own small way I pass the information on,” Lilianne said. Lilianne (nee Elizabeth Anna Donders) was trained to be a registered nurse and from 1976 onwards, earned her living by caring for patients in various hospitals. She is also a trained fashion design instructor. In 1980, she followed her husband, who was working for Shell, to Oman. And it is here where the real adventure of her life began and despite the trial and tribulations she had to endure on the health front, Lilianne transformed herself from a nurse and designer to a campaigner and a well known animal lover, with special emphasis on camels. She lived in Oman for eight years and formed some of the most intense friendships with Omanis. It was here in Oman she was adopted by Al Jenaibah tribe. That is where she earned the Arabic name, Layla. Sheikha Layla. Layla soon fell in love with the nomadic lifestyle and also became intrigued by their means of transport: the camel. That sparked the flame of an unusual wish to walk along the camel caravan routes of the past. And during their next posting to Syria, Lilianne bought four camels – mother and daughter pairs – namely, Zenobia and Zahra, and Zubeida and Sheba. But with the whiff of adventure also came the stench of danger when Layla was diagnosed with breast cancer. This was while she was preparing for the first camel caravan. During her radiation and chemo-therapy her husband was told that they would have to move to their next posting: Tehran. Rather than call the whole thing off, Lilianne decided on the spot to extend her walk starting in Damascus all the way to Tehran; the idea for the ‘Caravan for Cancer’ was born. This proved to be the real turning point for Layla and through her sponsored walk, she raised enough funds to establish a clinic for the Bedouin women living in the desert around Palmyra (Tadmor) in Syria. When the next move came up, this time from Tehran to Dubai, the itch to walk arose once more. This time the walk would go from Tehran to Muscat in Oman, and back again to Dubai. This voyage became the ‘Caravan of Hope’ with sponsorship proceeds being dedicated to building a mother and child clinic for Palestinian refugees. Layla believes that camels are power animals. “From the milk they produce to their urine, meat, everything is packed with good health and power. I have personal experience of it. Since I was affected by breast cancer and during the course of time, I put myself on a camel milk diet and camel urine therapy for a 40 days span. It proved to be quite a lifesaver and I personally believe the milk and urine has phenomenal curing properties!” Globally camel milk has become a craze, people and researchers have stumbled on to many health secrets that camel milk could provide. “The milk is a little salty and will take us few extra days to get accustomed to, but once you acquire the taste, you will love it. A recent research says camel milk can help cure autism and developmental syndromes,” noted Layla. Layla is already planning another trip. It was originally planned for November, this year, but later postponed to a year because their eldest son is going to get married this winter. “After surviving breast cancer, this is my first attempt at crossing the desert. This time I have more company, I will take my camels along. As I have said, camels know their way around and would take me safely across the desert. I feel much protected with them around and I am confident that I will never lose my way. These are the ships of the desert and can find their ways around. I know to speak the Bedouin language and can communicate with the tribes in the desert region. I am learning Arabic too.” The trip will take her from Muscat to Manah, Fahud, Rub Al Khali, Mughsayl, Sishar, Thumrait, Salalah, Shelim, Ras Madrakah, Duqm, Ramlat Al Sharkiyah, Sinaw, Muscat. I might need at least four months to complete this walk and is going to be another life changing experience for me! As Layla came out to see us off, her large pets, slightly stirred themselves from their pens, watching us from the corner of their bulging eyes, making sure that we did not steal their little human mother away from them! We wouldn’t dare mess up with her kids!